Register Log In Piano World Home Page Forums Pianist Corner 3 against 2. How to learn, practice? The difficult one is 3.1 against 2 . I've never seen the scales written out on paper in three vs. two. I can do it for C Major and then put it here . . . unfortunately not tonight though, or maybe tonight, we'll have to see . . . 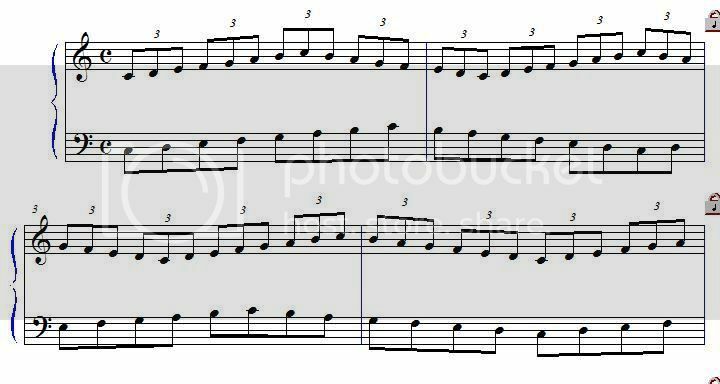 Depending on how your scales are it might be best to keep to this rather than wind up simultaneously practicing both long scales across the keyboard and 3 vs. 2. When you are ready, transpose a bit through the keys . . .
One of the Nouvelles etudes by Chopin is based on 3 against 2 if I remember correctly. I don't know your level, so can't tell if it's managable for you. Yes, it's the first one! It's a wonderful étude. It's how I originally learned to play 3 against 2. Last edited by Mr. Franz; 02/27/15 07:20 PM. There are plenty of Scriabin pieces to consider as well, just look at the Op. 11 Preludes. Much of that should be fairly accessible.